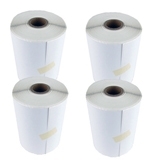 Direct Thermal Label -2" x 1.25"
$360.00 Per Case with 8 Rolls Per Case - 35,600 Labels Per Case! Product Size: 2" x 1.25" Rectangle with 0.125 Corner Radius. Final Carrier width of 2.125 inch. Label Repeat is 1.375 inch with Horizontal Perforation every 1.375 inch. Case Quantity: Packaged 8 Rolls per case...35,600 Labels per case! Contact us for quantity discounts, or individual roll sales!